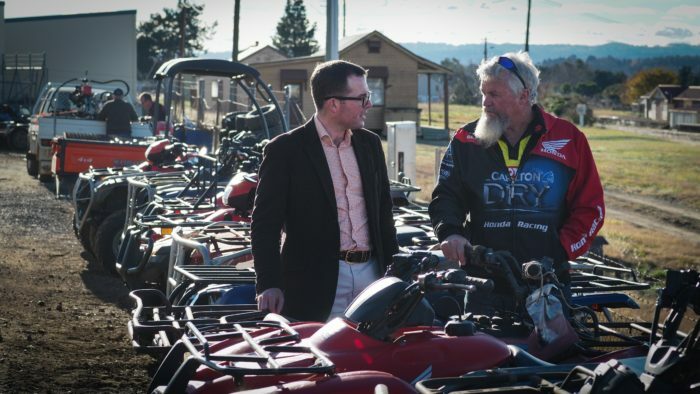 Northern Tablelands MP Adam Marshall, left, and Greg Frost of SuperMoto with the dealership’s queue of quad bikes awaiting servicing. THE LARGEST initiative ever launched in Australia to promote quad bike safety includes a $2 million rebate package to encourage farmers to buy safety equipment or swap for safer side-by-side vehicles. The new SafeWork NSW Quad Bike Safety Improvement Program, due to start in late July, is pitched directly at the farming community, the main users of quad bikes and the main victims of their unsafe use. “We know that quad bikes are currently the leading cause of death on Australian farms, with 220 deaths in the past 16 years and thousands more people seriously injured,” said Northern Tablelands MP Adam Marshall. The NSW Government will offer rebates of up to $500 on compliant helmets, Operator Protective Devices, the purchase of a safer vehicle, such as a side-by-side vehicle and undertaking training courses tailored for farmers. Greg Frost, owner of SuperMoto New England, which has one of the highest turnovers of side-by-side vehicles in the State, welcomed the program. “Farms are generally run by families, and if wearing a good helmet or stepping up from a quad to a side-by-side vehicle means a family doesn’t have to deal with death or injury, that’s good news for the community,” Mr Frost said. The small business rebate available for farmers under the NSW Quad Bike Safety Improvement Program is a time- and funds-limited incentive that begins on 19 July 2016. The NSW initiative emerged from a $1.3 million world-first testing and research project conducted by SafeWork NSW into quad bike safety. The study’s recommendations were considered last year as part of NSW and Queensland Coronial Inquiries into quad bike deaths.